A United Kingdom organization has given an innovation award to the Defense Department team responsible for developing and operating the field-deployable hydrolysis systems used aboard the U.S. ship MV Cape Ray this year to destroy tons of Syrian chemical materials. CBRN-UK, a British chemical, biological, radiological and nuclear industry special-interest group, presented the Tim Otter CBRN Innovator of the Year award yesterday to representatives of the DoD team, with members from the Joint Program Executive Office for Chemical and Biological Defense, or JPEO-CBD, and the U.S. Army Edgewood Chemical and Biological Center, or ECBC. The organizations, located at the Edgewood Area of Aberdeen Proving Ground in Maryland, were honored for their rapid response to world events in developing the field-deployable hydrolysis system. It is the first time CBRN-UK has given the award to a company or organization outside the United Kingdom. During a DoD News interview this week, Timothy Blades, director of ECBC’s Chemical Biological Application and Risk Reduction Business Unit, and Lloyd Pusey, JPEO-CBD’s product manager for the field-deployable hydrolysis system and joint project manager for elimination, discussed the award and their one-of-a-kind chemical-agent degradation system. Pusey deployed aboard the Cape Ray as a command post operator, monitoring and directing chemical destruction operations. He said the chemical operations crew, made up of 45 DoD civilian employees who volunteered for the mission, was eager to get the job done. Blades, aboard ship as commander of the chemical operations team, said the mission was an international one and his team worked with the United Kingdom and many other countries to make it happen. Blades said the award is a tribute to the talent, energy and commitment of the federal government employees responsible for the bulk of the system’s conception, design, procurement, fabrication, installation and operation. In late 2012, as the armed conflict in Syria spread into the region, DoD officials recognized that they lacked a deployable technology for destroying large amounts of chemical warfare materiel such as the Syrian chemical weapons stockpile. While the international community engaged with the Syrian government on giving up its stockpile, JPEO-CBD and ECBC formed a team to bring decades of chemical weapons destruction experience to bear on the problem. Other team members came from the Defense Threat Reduction Agency and the U.S. Army Contracting Command. The hydrolysis system was a fast-track acquisition project initiated officially in February 2013. Within six months, the team had conceived, designed, built and systemized a deployable system. By mid- to late-2013, with no nation willing to permit Syrian chemical agents to be destroyed on its soil, the team quickly adapted and installed two field-deployable hydrolysis units aboard the 648-foot Maritime Administration Ready Reserve ship MV Cape Ray. 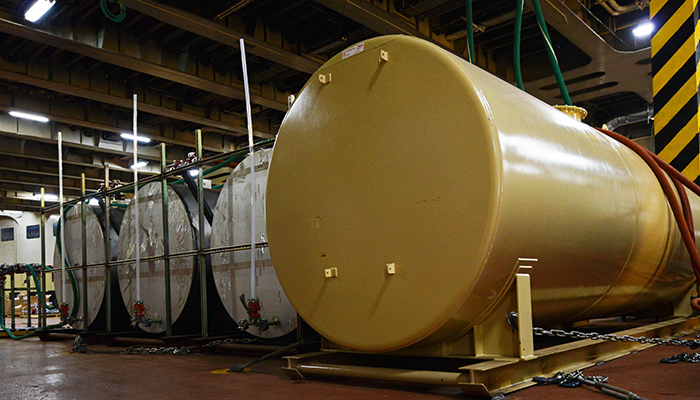 A series of tanks, part of the field-deployable hydrolysis system, aboard the MV Cape Ray. The system is designed to process bulk liquid chemical warfare agents, essentially mixing the chemicals with heated water, sodium hydroxide and sodium hypochlorite bleach to produce a low-level chemical waste that’s treated to reduce acidity. The waste is then stored in containers for delivery to commercial waste-treatment facilities. The Cape Ray’s chemical cargo from Syria consisted of 581 tons of methylphosphonyl difluoride, or DF, the main precursor of sarin and other nerve agents, and 19.8 tons of sulfur mustard, a blister agent. The chemical operations crew used the hydrolysis system to degrade the chemical agents in less than six weeks while the Cape Ray navigated the Caribbean Sea. Afterward, Pusey said, the Cape Ray transported the resulting chemical waste to Hamina, Finland, where the neutralized DF waste was offloaded, and Bremen, Germany, where the neutralized sulfur mustard waste was offloaded, both to be stored at land-based facilities. Pusey said the team that deployed aboard the Cape Ray depended heavily on reach-back support from their colleagues at JPEO-CBD and ECBC. “There were a lot of folks involved from both organizations who were supporting the efforts from Edgewood who deserve an enormous amount of credit,” he added. The Cape Ray arrived back in Portsmouth, Virginia, Sept. 17, and ECBC operators remained on board until month’s end to demobilize and recover the equipment from the ship and decontaminate parts of the field-deployable hydrolysis system that had been exposed to chemical agents so the ship could be returned to the U.S. Maritime Administration. Pusey, who acted mainly as a control room or command post operator during his months aboard the Cape Ray, said the mission was a roller coaster ride on the front end, noting that the ship staged in Rota, Spain, as it awaited its mission. “There was a lot of waiting in Rota, and that’s understandable given the circumstances of the chemicals that were coming out of Syria, … but morale was extremely high when we took off and hit Italy and [the port at] Gioia Tauro to pick up the chemicals,” he said. In hindsight, he said, the chemical-agent processing went remarkably well, but he found the day-to-day job of working with the chemicals in a completely new way an emotional experience. “We spent months planning for this, and there was still some emotional involvement in whether or not all of our planning was going to pay off,” Pusey explained, adding that the technical achievement of the field-deployable hydrolysis system is the highlight of his career. The system’s success prompted much enthusiasm and conjecture about its future uses, Blades said, “but we’ve been aggressive in cautioning folks … that the process appeared easy, [quick and clean] from the outside … but it wasn’t a walk in the sun.” The process of putting the system together was hugely complex, he said, requiring a lot of thought and very hard work. Pusey said that an enormous number of possibilities exist for the kinds of liquid bulk chemical material the system could be used to process. But the system was designed with the capability to deal with other chemicals of concern — precursors and the standard nerve agents, he added. Today, Pusey said, his job involves the next step for the field-deployable hydrolysis system hardware, “and frankly it’s very uncertain.” Seven systems originally were produced.